Lifetime achievement award for Rabbanit Bar-Shalom's contributions to hareidi education, activist's battle against road deaths. Education Minister Shai Piron (Yesh Atid) announced on Tuesday this year's winners of the prestigious Israel Prize for lifetime achievements to society and to the state. 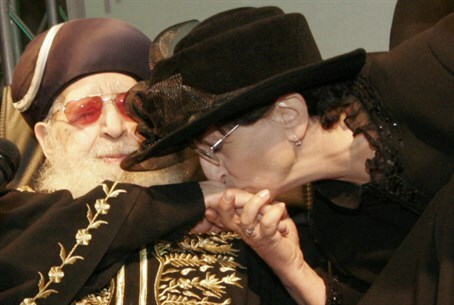 "The winners of the prize are Rabbanit Adina Bar-Shalom -- founder of the Hareidi College and the daughter of (former Chief) Rabbi Ovadia Yosef z''l, and Avi Naor -- one of the founders of the 'Or Yarok' (road safety) organization, and the hi-tech company 'Amdocs,'" declared Piron. In making its decision, the Israel Prize committee noted Bar-Shalom was selected "for her pioneering activities in bridging gaps and social divides, and for the advancement and integration of the hareidi lifestyle in social openness and higher education." The committee added that Bar-Shalom "in her faith leads to initiatives in which members of the hareidi society achieve secular education alongside Torah studies, as a means to social mobility and integration in the job market." "Adina Bar-Shalom succeeded in navigating the stormy waters of opposing world-views and strong controversy, and raised a significant cultural contribution," praised the committee. Avi Naor, Bar-Shalom's co-winner in the coveted prize, was credited for being "among the founding fathers of Israeli hi-tech. He chose to devote his efforts and money in ground-breaking initiatives in the field of struggling against traffic accidents, and the field of Israeli society." "Or Yarok," the NPO that Naor founded and funded, "successfully leads the fundamental and intensive struggle against traffic accidents, and is a central cause in the significant decrease in the number of those killed per year over the course of many years," noted the committee. Aside from Or Yarok, the prize noted that Naor "invests in a wide variety of ground-breaking social activities for troubled youth and the disadvantaged. His activities set new standards of deep involvement and management at the highest level, by which he leads the way in social involvement." This year's Israel Prize winner in the field of Jewish Religious Literature is Rabbi Dr. Aharon Lichtenstein. In late February, shortly after being named for the prize, Lichtenstein praised the Hesder yeshiva program, which integrates Torah study and IDF service.